Here’s an experiment: I’m uploading a PDF file from a Powerpoint I used to teach the first class of Traditional Chinese Medicine Dietary Therapy. The notes are based off of books by Joerg Kastner and Paul Pitchford. As an acupuncturist, low back pain is one of the most common complaints that I treat in the clinic. As helpful as acupuncture can be in managing low back pain, the problem often recurs. A patient will come to the clinic for a week or two and get sufficient relief to resume their daily activities, only to return in a few months with the same (or sometimes worse) pain. In these cases, the patient will ask me, “What happened?”, and I will need to tell them that acupuncture, as useful as it is in reducing the pain, isn’t going to solve the problem. The real key to making their back pain go away is… exercise. Yes, specifically exercise which will strengthen the core muscles of the abdomen and the back to keep the spine aligned against the force of gravity, poor biomechanics and other causes of disk injury and pinched nerves. This is not always what they want to hear, but it is what I have observed over more than two decades of professional acupuncture practice, which has included working alongside physical therapists in multi-disciplinary pain clinics. The patients who kept exercising fared much better than those who, for whatever reason, did not. 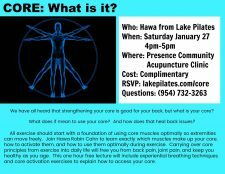 This is why I’m really excited to host a no-cost one hour class by Hawa Robin Cahn this Saturday at Presence Community Acupuncture. Hawa is the owner of Lake Pilates, just up the road from the clinic. I’ve been working with her personally on my own exercise goals, and I can tell you she is an excellent instructor with many years of experience. Her presentation is very clear, and she always starts with where her clients are at with a lot of encouragement and zero judgement. 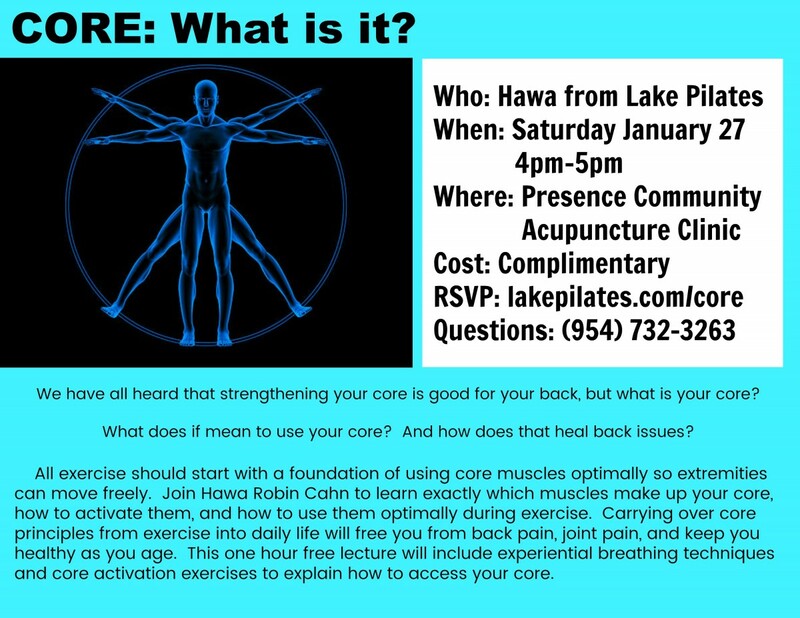 If you are interested in attending her class, please let her know by signing up at lakepilates.com/core or calling 954-732-3263. The class is scheduled for Saturday, January 27th, from 4-5 PM. You can click on the image above to see the flyer. Space is limited. I hope to see you there. More About The Needles 2: Colors! 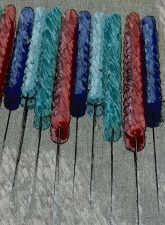 I often get asked about the needles I use, specifically about the difference in the colors of the needle handles. Frequently the handles of the needles that acupuncturists use are made of metal wire that is wrapped around the shaft of the needle. 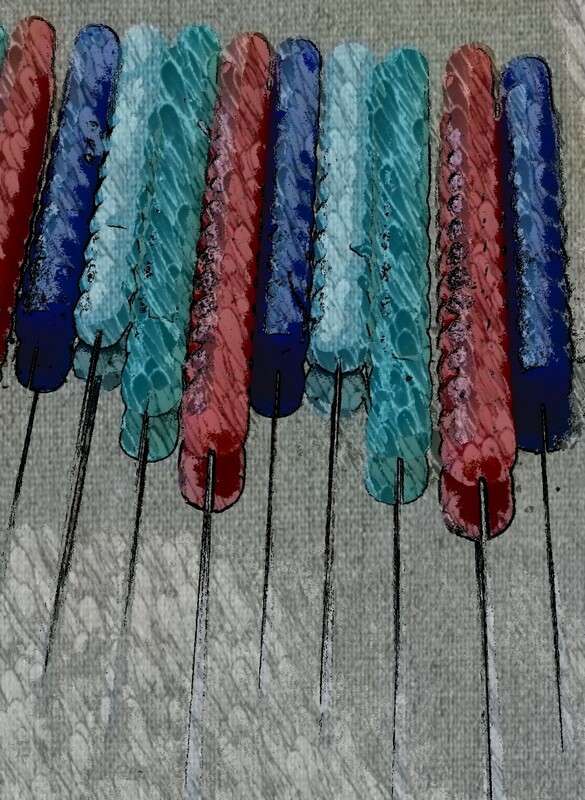 The needles that I prefer have plastic handles which are color-coded. The colors indicate the thickness of the needle. I use different thicknesses for different people and conditions. As a rule of thumb, I will start by using the thinnest gauges that I feel will be effective in treating the person, and may go up or down in thickness depending on the body’s response to the treatment. It’s worth noting here that all the needles I use are very thin gauges — the thickest being the light blue handles which are 0.20 mm in diameter, and the thinnest being the dark blue handles which are half that, or 0.10 mm. The most common gauges I use are in between: the red handles which are 0.16 mm and the green ones are 0.12 mm thick. As a point of comparison, the average human hair is between 0.06 and 0.12 mm, which means that the needles I favor are about as thick as a hair. I make comfortable treatment a high priority. After all of the selected treatment points have been needled, I will make sure you’re feeling okay. In my style of acupuncture, you should be able to rest naturally for 30 to 45 minutes without being distracted by the needles. If you feel any discomfort at any of the points being treated, let me know and I will make adjustments to alleviate it and allow you to relax fully to get the most benefit from your treatment. My preferred size of acupuncture needle, next to a quarter. A lot of people are creeped out by the thought of acupuncture because of the needles. 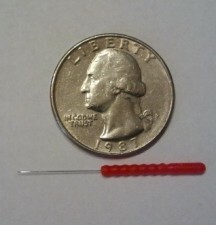 When they think of needles, they think of hypodermic needles, sewing needles, knitting needles… so for anyone who hasn’t seen an acupuncture needle, here’s a picture of one. This is the size I use most frequently. The needle shaft is made of sterile stainless steel, 15 millimeters (about half an inch) in length and 16/100 of a millimeter (about… ummm… *really* thin) in diameter. The handle is made from plastic, and is color coded (different diameters have different colors). The actual depth of insertion is about a quarter- to half-way, so usually about 1/8 to 1/4 of an inch or so – in other words, very superficial. I normally insert between 10-20 of these per treatment, on 10-20 people a day – which means I’m slinging up to 2000 of these little guys per week. So, if you haven’t tried acupuncture, or haven’t tried it in a while, maybe it’s time to get a treatment. The best places to get these relaxing, stress-easing, pain-relieving effects are the clinics of the People’s Organization of Community Acupuncture (POCA). There you can get acupuncture at an affordable rate, as often as you need it. Acupuncture – What Do You Use It For? A frequent question which arises when presenting acupuncture to people is “what do you use it for?”. And this is a very good question. We acupuncturists, having studied the use of acupuncture for a wide range of health issues, are tempted to answer “anything!”. But we usually point people to a list of medical conditions, such as the one composed by the World Health Organization. You can find a similar list on almost any acupuncture-related website, including this one. *people who just want to be somewhere that they can rest completely for an hour or so. One person remarked on their way out, that during the session she had come up with a creative solution to a problem she had been struggling with at work. She hadn’t gone into the session with that intention; she’d been there for knee pain. But in the process of relaxing and quieting her mind, which often happens during acupuncture, the inspiration came to her and she left feeling both relieved and motivated. People use acupuncture for all kinds of things, many of them not listed in any book. I hear about more and more of them with each passing month. If you get acupuncture, what do you use it for? I remember years ago hearing a story about a colleague who, while in Japan, visited a famous master of shiatsu (Japanese acupressure massage), who was around 80 years old at the time. After observing at the master’s clinic, the two of them went back to the master’s house, following his daily routine. There were three drinking establishments on the way back to the master’s house, and he would stop in at each of them. Each time he would stop, he would have a glass of water, a glass of beer, and a glass of sake. The colleague was amazed at the old master’s stamina, working long hours doing shiatsu six days a week, imbibing six drinks in the evening, and getting up early the next morning to do it all over again. What was his secret? The master replied that he did a practice called “Golden Shiatsu” every morning before rising and every night before sleeping. It is done on the abdomen, lying on the back, with the legs straight (or only slightly bent). Begin in the center of your belly, about halfway between your navel and the bottom of your sternum, or breastbone. With the fingertips of both hands, gently and slowly press into your belly. Don’t press too hard that it gets uncomfortable, just start with very light pressure. Then move your fingertips down to just below your navel, and press in gently again. Then move your fingertips across to your right, about 4-6 inches, near the point of the front of your hipbone. Then go up just under your ribcage, then to just under your sternum, pressing with the same slow, gentle pressure each time. Move your fingertips underneath the left ribs, then down near your left front hipbone, then finally end in the center, just above your pubic area. Then repeat the whole process 3 times, slightly increasing the pressure each time that you go through the cycle. Remember, go slowly and gently, don’t press so hard that you cause pain. The focus is to gently encourage the digestive system to eliminate any stagnant material in your belly. Try it twice a day for a week or so and see if it doesn’t help improve your digestion and help you feel better overall. I’ve been asked to write a blog post on my CA journey. Some background: I’ve been in practice since 1995 in a variety of settings. I worked in a rheumatologist’s office, a community HIV clinic, a CAM clinic at a hospital. I had private room practices in various settings: holistic center, home practice, chiropractor’s office. I’ve taught and been an administrator at acupuncture colleges for many years. I’ve taught CEU courses on Japanese Meridian Therapy since about 1998. In light of all that, I think it is pretty safe to say that I’ve been pretty well invested in the standard private room acupuncture model. I got interested in Community Acupuncture (CA) back when I read Lisa Rohleder’s Acupuncture Today series, back in 2007. I joined Community Acupuncture Network (CAN), and read the posts with interest. In October of 2008 I decided to open up a CAP (Community Acupuncture Practice) and began looking for space. I hired a realtor to help with finding spaces. The first thing I noticed was that she (like most other people, ultimately including myself, but more on this later) did not understand the nature of Community Acupuncture and so kept finding medical office spaces for me. I kept telling her “Imagine that I’m opening a yoga studio”, but she didn’t quite get it. This was complicated by my own inner doubts about the CA model, both in terms of economics and treatment style/efficacy. Finally we found a space that seemed a perfect compromise: a former architect’s office with a small waiting room, private office and a larger room which could accommodate 4 or 5 chairs. I immediately understood how I could use it. I would use the private office for intakes, and for private treatments on days when I wasn’t doing CA. The larger room would be the community room. I leased it, painted, had the flooring put in, and in January 2009 opened Presence Community Acupuncture. I found that I loved doing CA. It wasn’t too long before the idea of being a hybrid (offering private treatments and CA in the same office) was abandoned. But there were some difficulties. When I first started, I put four chairs in the large room and one table in the office. However, because the idea of treating in chairs was new to me, I lacked confidence in the method; after all, I had been treating on tables for 14 years, and had accumulated a lot of effective treatment strategies which involved needling the back and other areas that are difficult to access with the patient seated in a recliner. To make a long story short, I basically reverted to treating many of the patients as if I still had a private-room practice. But this limited me in terms of openings in my schedule; people would come with friends wanting treatment, just walk in, come early or late or on the wrong day, and often I couldn’t fit them in. My practice numbers declined, and I began to get frustrated: with my practice, with CA and CAN, with my job at the acupuncture college. Three years in, I knew something needed to change. Something had already begun to change, however. Late in 2011, my home was burglarized. I live in a lower-to-lower-middle income neighborhood. The economy has not been favorable over the last few years, and crime was on the increase; talking to the neighbors, my wife found out that every house on the block had been broken into at least once over the previous months. So my wife began to organize the neighborhood – something that had never happened where we live. Soon we had a community organization with monthly meetings, and involvement with city government and local businesses. With more attention being paid to our neighborhood, the city began to revitalize a business district right by our house. It became very clear to me that I needed to relocate my clinic there, around the corner from where I live. At that time it hit me. The thing that I had been missing about Community Acupuncture was community. I took a good long look at what I had been doing with the practice, and how it differed from the model promoted by CAN and now POCA. I looked at the groundwork that had been put down by my wife and the community organization. And I realized that between POCA, the local community and the city I had a lot of resources that I hadn’t been using, for various reasons, and that putting all of those resources together was probably the only way that the clinic was going to thrive. I opened the new location in December. There are no interior walls. There is a bookcase which divides the reception and treatment areas, some shoji screen dividers for storage areas and one table (used mainly for small children and the occasional back treatment request), and a growing number of chairs. We just had our Grand Opening event, drawing over 50 people from various communities: patients (current and not-so-current), former students, members of our community organization and others nearby, local business owners, and city commissioners and planners. We showed the Community Acupuncture documentary, and a lot of people attending the event got the whole idea of CA very clearly. The next morning, I had a decent 3 hour shift with 12 patients then drove to a health fair at a mosque in Miami. I gave an extemporaneous talk and so many people there were amazed and delighted that something like CA was available to them in South Florida. I handed out bunches of cards to people who couldn’t wait to tell their family and friends. Driving home afterwards, very tired after the previous 2 days, i reflected on how grateful i am that i got involved with CA, Lisa and Skip, and everybody involved in the CA movement, and especially how i’m able to bring this all together with my neighborhood, the people i live with, the people i pray with, people who need this and are excited to have the chance to get treated and tell others about it. God is Great. Oftentimes when acupuncture is discussed, either in the media or on acupuncturists’ websites, a lot of information is given regarding acupuncture in relation to medical problems. For example, you may have heard that acupuncture is good for arthritis, or asthma, or PMS, etc. And this is true, acupuncture is very effective in treating those sorts of issues. But there’s another side to acupuncture that a lot of people are surprised to discover: Acupuncture is a deeply relaxing experience. Now, if you’ve never experienced it, or only experienced certain types of acupuncture, you may find this to be a curious statement. But it is true. When you get acupuncture, it encourages the release of natural chemicals in your body which not only stop pain, but also help you to relax. In my experience, this effect is heightened by acupuncture in a peaceful group setting. I was struck by this one day in my former clinic location, which was fairly small. I had a room full of people receiving acupuncture together on a Saturday morning. That day, the tenants next to me began doing renovations in their space – the construction noise was so loud that it sounded as if they were inside my clinic rather than next door. I went back into the room full of clients, thinking they would be agitated and wanting to leave. Instead, I found them all fast asleep. This carries over, incidentally, into people’s lives outside the clinic. People who receive regular acupuncture often report that they are more calm during the day, even in stressful situations like work or traffic. Sometimes they tell me things like “When I start to feel especially stressed, I imagine that I’m in the chair in your clinic with all the needles in.” Sometimes people report that they begin to think more creatively when they are getting acupuncture, or that they receive inspiration, or process old memories. All kinds of things are possible from a deeply relaxed state. So, you don’t need to be in pain or have a medical condition to experience one of the most important benefits of acupuncture. You may find that it helps you to relax more profoundly than you thought possible. Here’s a link to an article i wrote about 10 years ago. It presages some of the ideas behind Presence Community Acupuncture. I explained to him that Chinese medicine has an alternative terminology, and that the language used is metaphoric, rather than scientific. Of course, it is possible for one’s liver to be inflamed – this is called hepatitis, which, when looking at this gentleman’s bloodwork report, he did not appear to have – but more likely, the other acupuncturist was using a common syndrome name we use in Chinese medicine: “Upflaming Liver Fire”. He also said the acupuncturist told him that his heart was weak, when his cardiologist had run a battery of tests and found nothing wrong with his heart. Spleen deficiency: You have a chronic weakness in your digestive system, and this results in tendency toward fatigue, bad digestion, weight gain, and muscle aches. Acupuncture can help regulate your digestion and increase your ability to properly absorb nutrients and get rid of excessive fluids and other waste products. Heart deficiency: You are having difficulty sleeping, or thinking clearly, or you are anxious. You may have temporary disruptions in your normal circulation, causing palpitations. Acupuncture can help restore normal sleep patterns and help you to remain calm, all of which can help restore proper circulation and reduce the incidence of abnormal heart rhythm. Lung deficiency: You are having difficulties with your breathing or your immune system is not functioning optimally and you catch colds frequently. Acupuncture can help regulate your respiratory and immune systems and reduce the frequency of these occurences. Kidney yang deficiency: You are experiencing decline in your vitality, and also may be having problems with the proper metabolism of fluids. Acupuncture can help you regain some of this function, and can help your body to process fluids more efficiently, reducing the frequency of urination or water swelling. You tend to feel cold often, and acupuncture can help restore proper circulation to reduce the occurence of cold limbs. Kidney yin deficiency: Your temperature regulation is imbalanced and you are experiencing hot flashes or head rushes, which often occur at night and may disturb your sleep. Your body is not producing enough moisture and you are getting symptoms of dryness. Acupuncture can help your body’s thermo-regulation, promote normal sleep and promote secretion of body fluid to reduce the dryness. These are some general examples and there are many more Chinese medicine syndromes as well as specifics which arise on a cases-by-case basis. It sometimes happens that a patient has read something about Chinese medicine and understands the difference between our metaphoric language and the scientific language of modern medicine; or it is possible that they are curious about the Chinese medicine view of physiology. In those cases, I won’t hesitate to elaborate further. But I think it is better to try and explain our findings in plain language to avoid confusing – or worse, alarming – the people who come to acupuncturists for help with their health issues.